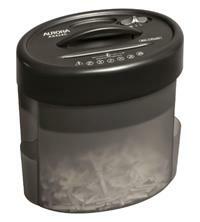 Perfect for light shredding, the Aurora AS424C is a small cross-cut shredder measuring just 25.2 x 24.1 x 17.6cm, making it ideal for placing on a desk or in any environment where space is limited. Due to its small size and paper entry mouth width, an A4 sheet needs to be folded in half lengthways when shredding – but the shredder can shred up to 4 of these sheets at a time. The Aurora AS424C cross-cuts documents into 5 x 47mm particles with a P-3 security rating. It’s also capable of shredding credit cards, small paper clips and staples. The waste bin has a capacity of 5 litres which will hold about 40 sheets – and it’s transparent so you can easily see when it needs emptying. Other features include a handle for easy portability, auto start, reverse function to help clear paper jams and thermal overload protection to ensure the shredder does not overheat.